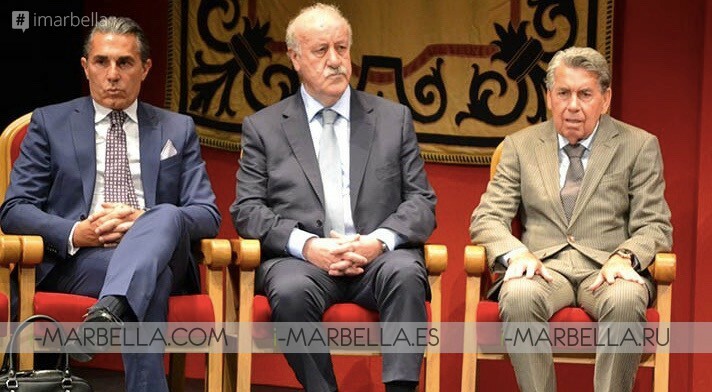 Former national soccer coach Vicente del Bosque, current Spanish basketball coach Sergio Scariolo and former tennis player Manolo Santana, have been named Honorary Citizens of Marbella this last Friday, June 1st, 2018 in a ceremony that took place at the 'Teatro Ciudad de Marbella'. The three honored, who already have a star on the Boulevard of Fame of Puerto Banús, have been very grateful and has highlighted their close relationship with the municipality. 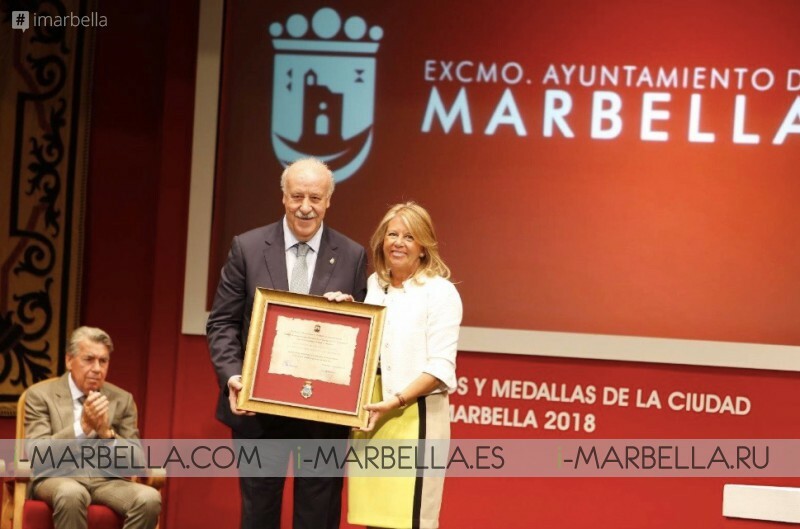 Marbella Mayoress has this weekend awarded as 'Hijos Adoptivos' (Honorary Citizens) Sergio Scariolo, Vicente del Bosque and Manolo Santana, to whom she has wished to pay tribute for his professional career and his connection with the city. 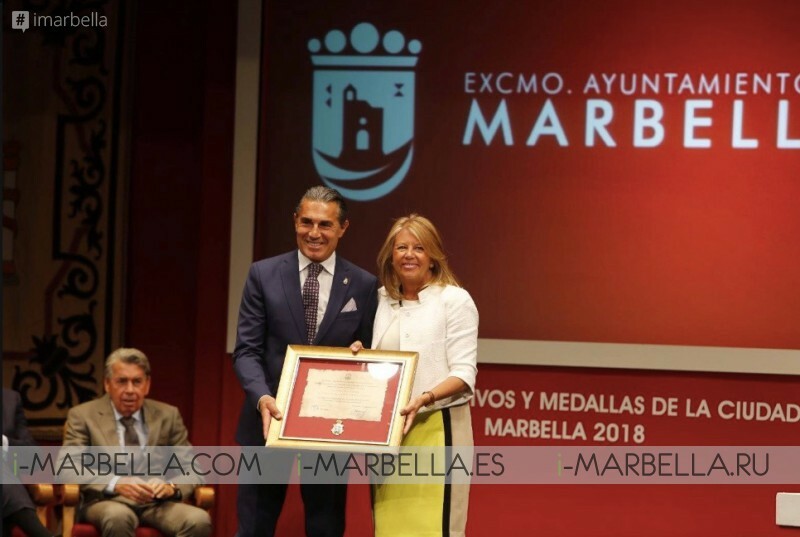 "This distinction goes beyond its sporting merits because it also represents a recognition of the values and human quality of the distinguished," said the mayor of Marbella, Ángeles Muñoz. Although they weren't born here they've served as illustrious ambassadors of Marbella city. 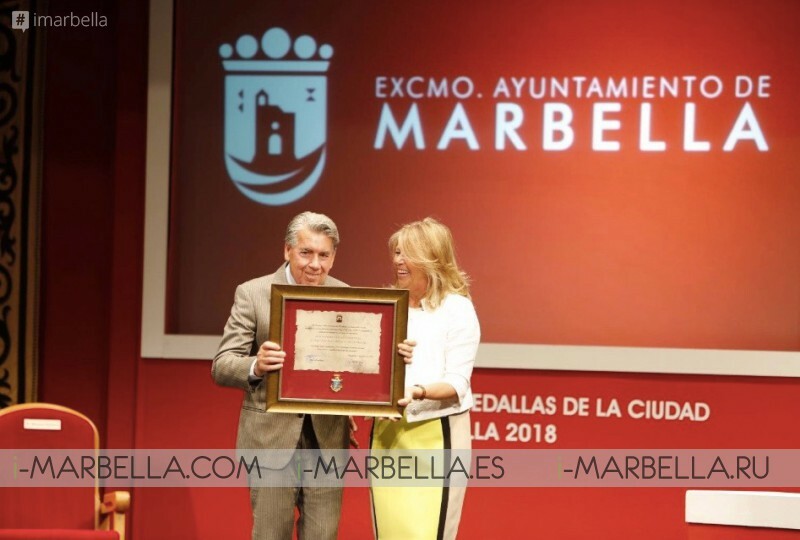 And it's also a gift that Marbella’s DNA has in personalities and entities such as Protección Civil Marbella, Librería Mata, David Delfin and Rafael de la Fuente, who has been awarded the medal of the city. Santana, who recently turned 80 on May 10th, concurring with the ‘Mutua Madrid Open’, a tournament in which he has been the director until this season, will fly this Sunday to Paris to support the Spanish tennis players in a Roland-Garros - The 2018 French Open, tournament that he won in the editions of 1961 and 1964. "I arrived just for one day and it has been 36 years since", said Manolo Santana in his acceptance speech, after receiving recognition from the mayoress, Ángeles Muñoz. He has also shown admiration to the other two awarded in the ceremony, stating "Sergio (Scariolo) and Vicente (Del Bosque), which are phenomenal, monsters,"
"I am very proud to live in a city as wonderful as Marbella", added Santana, who has had words of love towards his wife Claudia, who "makes everything easier". Vicente del Bosque, who also owns a residence in Marbella, where he usually spends his summers holidays and where sometimes participates in solidarity events. Said ''from Salamanca living in Madrid, Marbella is the third city in this triangle'' referring to Marbella as his third home place. Regarding Santana and Scariolo, Del Bosque has shown his "admiration and appreciation", and confessed that he feels as a "lucky man" for being part, for about 36 years in a club like Real Madrid and eight years in the national team, ''a very exciting journey''. Scariolo settled down in Marbella more than ten years ago, wherein 2017 he was a preacher of the San Bernabé Fair. 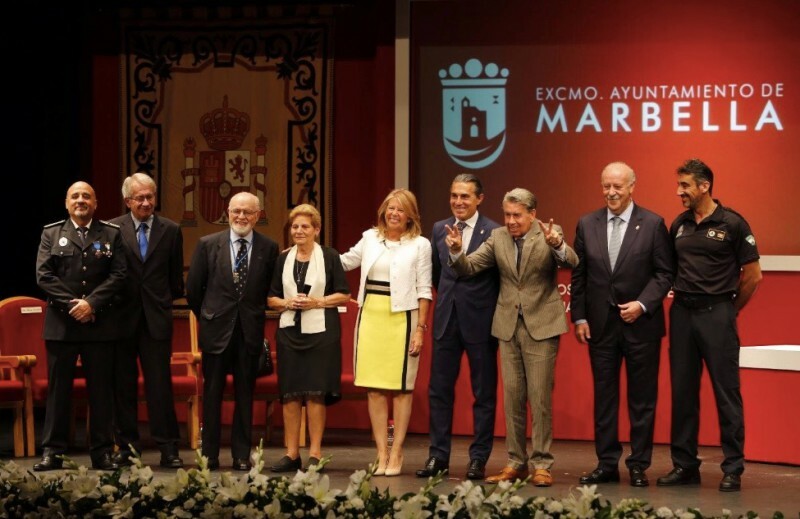 Now he has been named as an 'Honorary Citizen, a title he showed appreciation for and has assured that he "reinforces" his connection with this city of Malaga to "try to help the city's reputation grow." In the same way, there was also place for a medal ceremony rewarding the designer David Delfín, who died almost a year ago, the prize was received by his mom María González in a very emotional speech acceptance. The designer spent his most of his childhood and adolescence living in a very known neighborhood ''El Barrio de Marbella'' until he decided with 18 years to go to Madrid to "pursue his dream." In the same way, the City Council recognized with a ' Medal of the City' to the hard work of the Local Association of Civil Protection Volunteers in Marbella, which was established 32 years ago, as well as the 'Mata Bookstore', which after 80 years of being open to the public has closed last November. "Closing a bookstore today is not easy but there is a time when life has to continue its course," said José Andrés Mata, son of Andrés Mata, founder of the first and only bookstore in Marbella during three decades in the year 1937. Another 'Medal of the City' was also given to a tourism guru in Costa del Sol, Rafael de la Fuente. who has been from a receptionist to a director in luxury hotels such as 'Los Monteros' and 'Don Carlos de Marbella', and now the director in a hostelry school known as 'La Cónsula'. "Fifty years ago my wife and I just got married in Marbella, so it was obvious that this place was destined to become one of the best destinations in the world," he said during his speech.